SARASOTA — Shawn Garner watches over 18 tanks of hundreds of tiny sea horses, bobbing among the artificial sea grasses and plastic zip ties provided to give their tails a hitching post. "It's the coolest animal in the world," he said, showing them off with a touch of both pride and awe. "It has a head like a horse, a tail like a monkey and a pouch like a kangaroo." Garner, supervisor of the Mote Marine Laboratory's sea horse conservation lab, is one of several experts across the country trying to raise ornamental fish and other wild marine species in captivity. These researchers, many working at aquariums and zoos, are engaging in the kinds of farming operations once reserved for fish sold in food markets and restaurants. For sea horses, the stakes are high. Nearly one-fourth of the 36 sea horse species assessed by the International Union for Conservation of Nature are threatened with extinction. Three factors account for the deaths of tens of millions of sea horses each year: the Chinese medicinal trade, accidental catch by shrimp trawling and other fishing operations, and habitat destruction. 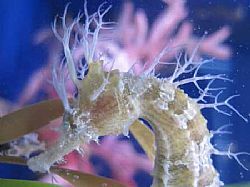 "Being able to breed and raise sea horses is one part of the solution. Unfortunately, it's not the only solution," said Heather Koldewey, head of global conservation programs for the Zoological Society of London, adding that fishing restrictions and other coastal protections are also essential.